Following the natural border of the Kapuzinerberg between Platzl Square and Franz-Josef-Strasse, you will find one of Salzburg′s busiest roads, which has been busy ever since Roman times: the Linzergasse Lane. It is well-known for its excellent shopping opportunities. 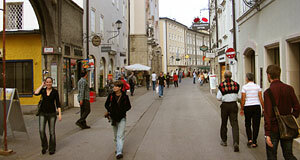 Linzergasse is often considered to be the "little sister" of the Getreidegasse on the left side of the Salzach River. All traffic going from Salzburg north-east - wards went through this lane for centuries, entering or leaving Salzburg through the Linzertor Gate, which limited the lane until 1894. Most buildings in the Linzergasse date back to the 14th and 15th century, although almost all of them were re-modelled over the course of the centuries. Finally, the great fire of 1818, which caused severe damages on the right side of the Salzach including Mirabell Castle, the Dreifaltigkeitskirche and the Primogeniturpalast, also caused a lot of destruction in the Linzergasse. The Linzergasse has always been the busy lane of "small" craftsmen and merchants, on contrast to the somewhat cosmopolitan Getreidegasse with its much wealthier residents. If you stroll along the Linzergasse coming from the Staatsbrücke Bridge, you will quickly come to the Platzl Square. The famous naturalist and doctor Theophrastus Bombastus von Hohenheim, more commonly known as Paracelsus, lived in the house number 3 in 1541. House number 7 hosts the "Engel Apotheke", the pharmacy in which the expressionist poet Georg Trakl worked as an assistant in 1887. House number 9 is the "Gabler Bräu" brewery; the family owning the property has a famous son commemorated by a plate on the house: Richard Mayr, an opera singer who was born here in 1877. Walking further up the Linzergasse, you will find the entrance to the "Passion Walk" on the right hand side - this path will lead to up to the Kapuziner Abbey with many rewarding views over Salzburg. Sticking with Linzergasse, you will come to the Sebastianskirche church and its famous cemetery. Near St. Sebastian, the Linzergasse ends - as mentioned above, where a gate of the city walls was until 1894. In recent years, many of the houses in the Linzergasse and bordering alleys and lanes have been renovated. The small merchants and traditional craftsmen successfully occupy the lane and most of them seem to be very proud of being Linzergassen residents. Every year in the summer, the "Linzergassenfest" bring together the locals with tourists and everybody interested in celebrating this most "Salzburgian" lane.